Last year’s edition attracted 80,000 participants. After a record footfall in 2014, organisers have added extra floor space for The Big 5 this year in anticipation of a larger turnout. Educational seminars will be a key highlight. As the Middle East’s biggest construction event opens its doors this month in the UAE city of Dubai, the buzz on the floor – aside from who’s winning what and where to who’s showing off the latest technology and who’s got the best stand – will unsurprisingly be on the best ways to build cheaper and more sustainable homes. 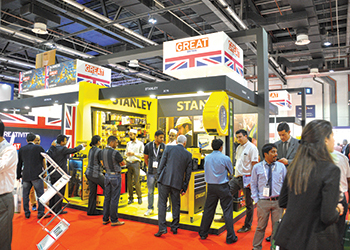 Now in its 37th year, The Big 5 2015 is expected to attract as many as 85,000 participants over the course of its four-day run from November 23 to 26 at the Dubai World Trade Centre, according to dmg::events, the show’s organiser. Exhibitor numbers have also risen by 10 per cent to 3,000, compared to the previous year, says dmg. 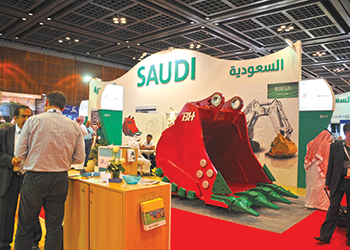 As in the previous years, two major shows – Middle East Concrete 2015 and PMV Live 2015 – will be co-located with The Big 5. However, visitors to this year’s event will notice a new hall called The Big 5 Focus, which dmg says will offer insights into the latest technology, roject management challenges and opportunities. And with Gulf states pushing hard to build more affordable homes for their citizens, dmg has lined up a host of experts who will offer their views on how contractors and builders can benefit from this boom. These seminars come at an opportune time. Saudi Arabia is reported to be injecting $66 billion into affordable homes, while Bahrain has embarked on a plan to build 40,000 social housing units by 2022. Meanwhile, Oman’s development plan (2011-15) seeks to implement housing projects with a budget of $1.16 billion and its ruler Sultan Qaboos has recently granted $520 million for a programme that includes housing loan projects. The UAE too has similar initiatives under way: the Dubai Municipality announced in March that it has allocated over 100 hectares of land for affordable housing in Muhaisnah and Al Quoz. While Qatar and Saudi Arabia have provided affordable housing to low-income nationals since the 1960s and 1970s, respectively, the young age of the region’s population and booming real estate markets have also played their part in prompting a renewed interest in the provision of affordable housing. With this sector creating ample business opportunities for construction companies, dmg has rolled out a dedicated programme concerning affordable housing and sustainable communities, providing the latest key insights on this topic. Forming part of 75 CPD (Continuing Professional Development) certified workshops led by industry experts from around the globe, the free sessions include a seminar on whether sustainable and affordable housing can become a reality in the Middle East, whether sustainability and affordability are opposing metrics, and what it will take to deliver on regional ambitions for sustainable housing. This will be delivered by Abdallah Bdeir, chairman of Jordan’s Green Business Council; and Meshal Al Shamari, director of Qatar’s Green Building Council; Gerry Rogers, senior associate, Galadari Advocates and Legal Consultants (DIFC). There will also be a case study on Fujairah’s Vision 2040 masterplan. This will be presented by Alaa Saber Mahmoud, project coordinator at Fujairah Municipality, and will provide an overview of the strategic masterplan for the emirate and highlight the challenges and opportunities in the construction sector. In other seminars, keynote speakers and industry leaders will offer insights into the role of green building and alternative methods to constructing affordable housing, sustainable design and procurement of affordable housing, and some of the latest technologies and innovations being used to design, and construct affordable housing. • Can sustainable and affordable housing become a reality in the Middle East? • Affordable housing construction technology solutions. Another highlight will be The Design Summit. To be held on November 24, the summit will bring together architects, consultants, urban planners, engineers and contractors and will be the only conference in the region to offer free detailed insight into the latest design trends, new technologies and techniques such as sustainability and cost-efficiency, whilst also providing unparalleled on-the-ground analysis of local and regional Middle East markets. Additionally, in order to better align local, regional, and global suppliers with the specific needs of local markets, The Big 5 will feature more live product demonstrations of technologies that are shaping the broader construction industry at the PMV Live. MAN Truck has even chosen the event to celebrate its 100-year anniversary. Calling PMV Live one of the most important heavy construction machinery, plant equipment and construction vehicle events in the region, Dr Richard Brown, head of product management at MAN Truck and Bus Middle East and Africa says the latest resource-saving, environment-friendly vehicles are available to the region but that the market has so far been reluctant to adopt them. “The industry has an ideal opportunity to offset this impact through the use of green construction vehicles, but without regulations to govern their use there is little incentive to do so at present,” he adds. The global construction equipment market is forecast to reach $241 billion by 2020 and growth in the Middle East is a major part of this feature. Alongside PMV Live, Middle East Concrete provides a regional platform for the concrete industry, which continues to invest heavily in sustainability and provide impetus to a drive for efficiency and green solutions. In a similar fashion to the workshops and seminars, participating exhibitors will bring experts to showcase products in action, giving all visitors the opportunity to assess the suitability of a product for their projects in real-time. The available floor space is also set for an eight per cent increase from 52,265 sq m in 2014 to 56,400 sq m in 2015, following the expansion of Dubai World Trade Centre and strong demand from exhibitors. Together with strong demand, extra floor space will also be used to accommodate The Big 5 Focus hall. As the latest addition, The Big 5 Focus has been created to serve the increasing number of visitors seeking information on the challenges and opportunities for technology in construction and project management. The hall will feature an education seminar titled Technology in Construction, and a project management seminar in association with PMI’s UAE Khaleeji chapter. The show will also feature the GAIA Awards, which were launched in 2008 and honour companies in the construction sector whose products and services demonstrate a reduction of construction’s impact on the environment. The 2015 winner will be eligible to receive more than $50,000 worth of marketing support, in order to showcase the winning product to the market.